BELIZE CITY, Sat. 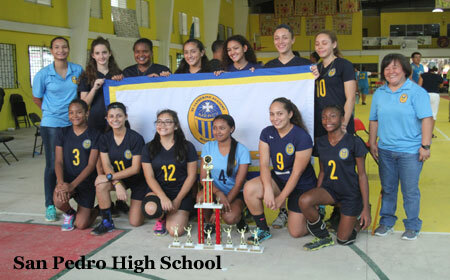 Nov. 12, 2016–The National Secondary Schools Sports Association (NSSSA) held its 2016 national volleyball championships over the weekend at the Sacred Heart College auditorium in San Ignacio, where the four high school zone champions for females and males competed for the respective national titles. The tournament followed a simple knockout format, with St. Catherine Academy girls emerging as champions in the female category, and San Pedro High School boys in the male category. At the end of the tournament, in addition to individual awards for best individual performances, the 1st, 2nd and 3rd place winners received team trophies and individual medals from tournament sponsors, SOL Belize. In game 1 on Friday afternoon, the SCA girls blew out Southern Zone champs, Stann Creek Ecumenical College girls, 25-7, 25-8, 25-10. Game 2 saw Western Zone champs, Belmopan Comprehensive School girls eliminating Northern Zone champs, New Hope High School girls of Orange Walk, in 3 sets, 25-14, 25-17, 25-16. In Game 3, the consolation game for 3rd place on Saturday morning, Ecumenical girls won, 3-1, over the Sugar City girls, 23-25, 25-23, 25-16 and 25-15. And in game 4, the championship final on Saturday afternoon, SCA girls hammered the Compre girls in 3 sets, 25-16, 25-13, 25-21. It was the 16th NSSSA Female Volleyball Championship for the St. Catherine Academy, girls team. In game 1 for the males on Friday evening, Central Zone, champs, Belize High School boys stunned the Southern Zone champs, Toledo Community College (TCC) boys in 5 gruelling sets, 25-18, 17-15, 19-25, 25-23 and 15-13. Game 2 on Friday night saw Northern Zone champs, San Pedro High School boys prevailing in a dogfight against Western Zone champs, tournament hosts Sacred Heart College (SHC) boys, in 5 sets, 25-13, 25-27, 25-17, 25-27 and 15-5. In game 3, the consolation game for 3rd place on Saturday morning, the TCC boys won in 4 sets over SHC boys, 14-25, 25-10, 25-22 and 25-20. 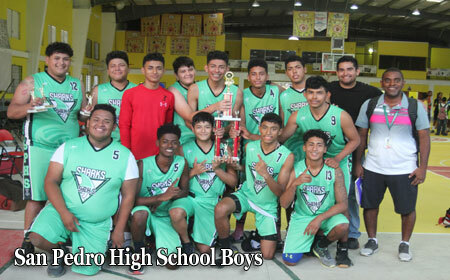 And in game 4, the championship final on Saturday afternoon, San Pedro HS boys came back from a first set deficit to win, 3-1, over Belize High School boys, 22-25, 25-19, 28-26, 25-18.